The arrival of spring—and a host of fresh, local ingredients—has gotten me pumped about cooking. Last night, I made pizza. Oliver mandates a flour-on-the-counter-make-a-well method of incorporating the wet and dry ingredients. I tried this once and suffered a breach of the flour wall. Disaster! So, I start everything in a big bowl and move in to the countertop once most of the liquid has been incorporated. By the time last night's cooking was finished, I had dinner and nine individually portioned balls of dough nestled in my freezer. The dough was enough of a project, and I didn't have any leftover sauce in the fridge, so I decided to go simple with the toppings—jazzing things up with later with a tangy, peppery arugula salad dressed with lemon vinaigrette (lemon, dijon, good olive oil, salt, pepper and a drizzle of honey; added to counteract the sharpness of my other ingredients). After rolling out the dough (using an old wine bottle) super thin—I'm New Haven-style all the way—I topped my pizza with local Shellbark Hollow Sharp Chevre, pine nuts and a drizzle of my nice olive oil. 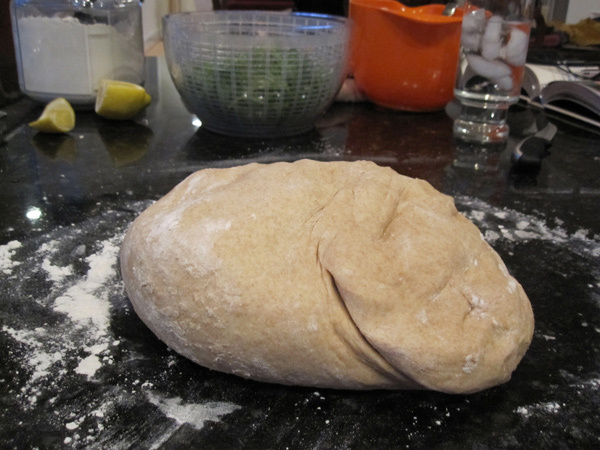 I don't have a paddle, so I just use my largest pot lid, dusted with flour, to transfer the 'za to the oven. The key to home pizza cooking is a pizza stone. This is one of the best purchases I ever made (mine cost about $20; but I'm sure there are cheaper alternatives). It leads to a crispy, bubbly crust—and keeps cooking time under ten minutes. I was very happy with my results. The Shellbark Hollow chevre was a spectacular, pungent addition and the Daisy Flour reminded me that bread should have an actual taste. And, with the huge mound of local arugula finishing off the dish, this was practically health food.